Chronicles ongoing development projects in the Spokane area. Just north of Kendall Yards, a new apartment building, the College Avenue Apartments, is rising out of a former vacant lot. Located on the 1300 block of College Avenue, this high-design building will feature 27 apartment units totaling roughly 33,000 square feet. Designers at HDG Architecture say that a strict budget resulted in a clean, simple design for this wood-framed development. And indeed, constructing the building to the street and including bike racks and other pedestrian-oriented amenities will certainly be appreciated in this urban environment. We visited the site on Sunday, and have construction progress photos below. Last year, Seattle adopted a bold, transformative Comprehensive Plan they called Seattle 2035. In addition to recommitting to a growth strategy that places most new housing and jobs in mixed-use urban villages, Seattle’s new Comprehensive Plan makes transit-oriented development near future Link light rail stations a policy priority and begins a transition toward parking maximums and the use of new, more relevant, and transit- and pedestrian-focused metrics to evaluate new projects. In many ways, despite taking nearly two years to write and pass, the document expresses a strong, cohesive vision for Seattle’s future––one that recognizes its status as a city that will welcome 120,000 residents by 2035. It also adopts racial and social justice standards that have already become a national model. Spokane is not Seattle, but it too has been revising its Comprehensive Plan through what it calls the Shaping Spokane process. In fact, the City is at the tail end of the process, and City Council is expected to vote on the update next week. Unlike Seattle 2035, however, despite four years of deliberations––almost twice the time it took Seattle to write a model Comprehensive Plan––the Spokane equivalent, Shaping Spokane, punts on most of the major development and planning issues facing our city. And in at least one case––that of our hard-won Complete Streets ordinance––it does critical damage. First, let’s acknowledge that the Shaping Spokane plan does some good things. For example, it adopts a housing policy which clarifies existing rules on accessory dwelling units (ADUs), encourages mixed-income housing opportunities where possible, and clarifies existing language on housing quality. The document even includes an “affordable housing requirement” policy which essentially encourages the City to develop a mandatory inclusionary zoning program. Many pieces of the Transportation chapter contain strong endorsements of public transit and frequent transit in particular. Centers and Corridors, for example, have languished despite being Spokane’s attempt at pedestrian-oriented urban districts. Jim Frank of Greenstone, the developer of Kendall Yards, has famously said that the type of development underway in that urban district would not be possible without the Kendall Yards Planned Unit Development agreement. Indeed, some developments flout the zoning guidelines to such an astonishing degree that casual observers have to wonder whether developers think they’re getting away with some clever ruse. The Target in Southgate, the first implementation of Centers and Corridors on a greenfield development, is a sea of surface parking surrounding a single use––big-box retail. And another development on the KXLY site across Regal is set to get underway soon. Are our City’s planners considering these high-profile land use planning failures when writing Shaping Spokane? Shaping Spokane doesn’t make a serious effort to place Spokane at the forefront of livable cities across the country. No major actionable objectives and metrics for success (i.e. 100,000 sq. ft. of new affordable housing development) on core issues. No real talk of parking maximums, of reductions of parking requirements which make projects exorbitantly more expensive for little real benefit. No changes that could make affordable rental housing easier and less costly to build. No discussion of municipal fiber, despite much of our city lacking access to affordable internet service due to the Comcast monopoly. No big push for policy aimed at the future of transporation technology (driverless vehicles). Nothing aimed at reducing setback requirements, no major updates to the development code. No bold pushes––they’ll have to wait until the mid-2020s(! ), by which time we’ll be well behind our peer cities. Perhaps most critically, under the guise of economic development, the Comprehensive Plan attempts to gut our hard-won Complete Streets ordinance. Under the Shaping Spokane plan, City staff would be allowed to essentially submit projects at their sole discretion to the 6-Year Street Program, where they would jump the list over other qualifying street projects and would not be subject to Complete Streets requirements. Under this Comprehensive Plan update, City staff vaguely assert that “[these projects] will typically address only the most pressing transportation elements first with other integrated elements added over time.” In other words, features like sidewalks, transit elements, and bike lanes would not be constructed as part of a “Roadway of Significance”––they’d be added at a later date. The only problem? Shaping Spokane sets out no metrics or guidelines for this provision’s use. The wording is so vague that nearly any project with some form of economic benefit (the provision does not set a dollar amount or number of jobs such investment would support) could be named a Roadway of Significance, and there would be no timetable for full build-out of Complete Streets elements. Even if current City staff may care about sidewalks and bike lanes, and fully intend to construct them at later dates for these projects, we don’t know what future City staff would do. The Comprehensive Plan is meant to transcend staffing changes and personnel moves. That means that effectively, this provision could eliminate Complete Streets––and all the sidewalks, bike lanes, transit stops, and ADA curb cut-outs it requires––entirely. It is so poorly written that the only solution that would completely eliminate the risk of abuse on the part of City staff would be to strike it entirely. Attend the next City Council meeting. The Comprehensive Plan update hearing will take place Monday, June 19th at 6:00pm PT in the City Council Chambers at City Hall. Attend the meeting, voice your concerns, and speak your mind with Council. Email City Council with your thoughts. Locate your City Councilmember here. Share your thoughts on this Comprehensive Plan update––in particular consider the gutting of Complete Streets in this draft. Shaping Spokane will pass in its current form if there is no major opposition from the public. But we hope that you will consider attending the Council meeting or emailing your Councilmember––at the very minimum to eliminate the absurd “Roadways of Significance” provisions in this Comprehensive Plan update. At the end of the day, most of Shaping Spokane is status quo for Spokane, which isn’t a tragedy. But it is a major abdication of regional leadership and a significant missed opportunity to lead the way into a more urban, walkable, and mixed-use future. If we don’t step up soon, and lead the way on sustainable planning, affordable housing, walkable urban districts, and convenient transportation, we will continue to watch other cities pass us by––and sadly, we will fall further and further behind. SHARE YOUR THOUGHTS: What do you think? Is this Comprehensive Plan a step backward or forward for Spokane? Do you think we should be thinking more boldly about the future of our city? Do you think we need updates to Centers and Corridors or to Complete Streets? Share your thoughts in the comments below, on Facebook, on Twitter, or in person. We love to hear from you! Wonder Spokane, LLC has proposed a massive adaptive reuse of the former Wonder Bread Building on the North Bank of the Spokane River. The proposal would add a mostly-glass third story to the building and inject a market hall into the first floor, with office space above. Here’s one I just couldn’t wait until Monday to share. Wonder Spokane, LLC has proposed a stellar, game-changing adaptive reuse of the former Wonder Bread Building on the North Bank of the Spokane River. The 111,000 square foot former bakery sits at 821 W Mallon Ave, directly across from the Spokane Arena. At its peak, the plant produced 500,000 pounds of bread products each week, until it closed in 2000. Now the investors of Wonder Spokane, LLC, apparently led by Denver lawyer and businessman Pete Mounsey, believe the building can be a promising site for redevelopment, as they’ve applied to attend a Pre-Development Conference* with the City. Their version of the Wonder Bread Building would see it completely transformed and restored, adding a partly-glass third story and other unique amenities. The first floor of the historic building would occupied by a market hall concept much larger than Spokane’s only other existing market hall, Saranac Commons. The second and third floors, meanwhile, would be occupied by leasable office space, with an event space and rooftop patio on the third floor. In addition to the redevelopment of the historic building, the developer proposes an attractive-looking parking garage with two completely separate retail spaces on the west (Lincoln St) side. The sum total of these investments would be a complete revitalization of the North Bank of the river and significantly more life on this crucial corridor connecting the Spokane Arena with Kendall Yards. We look forward to hearing more details as the developer shares its plans. The former Otis Hotel, located at 110 S Madison in Spokane’s West End, has been vacant since 2007, when the low-income residents who then called the building home were evicted (often in not-so-great circumstances) to make way for a new condo development. Ultimately, that condo development failed in the recession, and ownership passed from investors to banks and back again. Now, it again looks like a developer is exploring redeveloping the property. While at this point the developer is unknown, ZBA Architecture, which perhaps most famously served as the architect for the Community Building/Saranac remodel, has attended a Pre-Development Conference with City staff. The Otis Hotel project would remodel and modernize the former SRO units on the second through fifth floors into studio and one-bedroom apartments at a total construction cost estimated at $4.5 million. With floor plans ranging from 250 to 510 square feet, and ultimately as many as 100 apartments occupying the building, it’s safe to classify the project as a “micro-apartment” project. The first floor would likely see remodeled retail space. Indeed, while the pre-development conference includes no construction timeline, and a Pre-Development Conference is not a building permit application, we should take this news as confirmation that there is significant interest in redeveloping the former Otis building. Last year, we heard that a developer was interested in constructing a 26-story condo tower at 230 N Division St, a former auto shop on a prominent site at the edge of the University District and the East End of downtown Spokane. The proposal seemed to be as serious as any in technical terms (planning documents featured relatively detailed architectural renderings), but unrealistic given the relative distance from the city’s central core and the not-altogether-great history of then-involved developer Lanzce Douglas. Now, a new developer has submitted a Pre-Development Conference for a major development at that site. University Housing Partners of San Clemente, California already developed the already-popular 940 North project on Ruby. Now, the firm has proposed a six-story mixed-use project featuring five floors of housing aimed primarily at WSU Spokane and EWU Spokane students. The $20 million project would include 12,000 square feet of retail along both Spokane Falls Boulevard and Division Street, a critical factor in engaging the street level. 100 parking spots would be tucked behind the street as we suggested in our post on the original proposal for this site. And renderings (more after the break) feature significant architectural interest and color. When the Jensen-Byrd District plan was revealed in full for the first time last week, we rightfully noted the spectacular form and scale that the plan took. At 250,000 square feet, it’s the largest downtown Spokane development in nearly a generation. And by including space well-suited for high-tech and biotech companies, it could mark a turning point in Spokane’s overall economy. But it’s important to note also that the site plan has some significant pain-points, challenges which we expect to be resolved before the developer is granted a building permit. It’s easy to forget that once a building is built, it’s likely to remain there for at the very minimum, fifty years (well, most of the time). 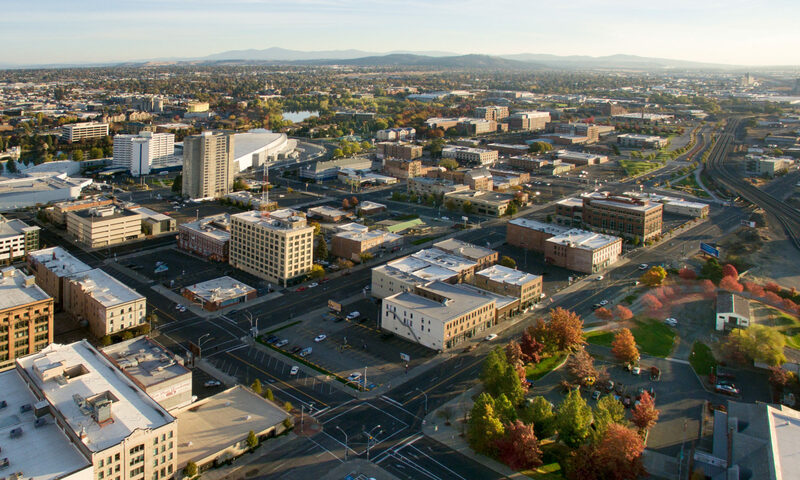 That’s why we need to ensure that this development is held to a high standard: the University District is intended to drive Spokane’s economy in the 21st century and beyond. To create a place fit for the next fifty-plus years, we need to do better than the current plan. Here are some concrete steps to making that happen. 2. Develop a phased master plan for the overall site, including development for the surface parking lots included in the current site plan. There’s zero justification for the surface parking lots to remain on the site plan, given the 450-space parking garage included in the first phase. This land would be better put to use in the interim as open space or public parkland; in the future, it should be developed to support the continued growth of the University District. As of now, however, we don’t know when or whether that will happen. This planning and building approval process should include specific planning for these sites. 3. Repave the section of Main Street in front of the Jensen-Byrd Building with brick, and close it to vehicles, to create a more inviting pedestrian landscape and a plaza of sorts for events and special occasions. Even if the street is not closed to vehicles, it would be more vibrant, more interesting, and more programmable if paved with brick. Imagine Friday food truck gardens or Saturday farmers’ markets on this site. Paved with brick, this could become a huge selling point to any potential tenant of the Jensen-Byrd District development. Overall, these three changes could go a long way toward improving the Jensen-Byrd District plan. It’s unclear what degree of flexibility to public comment the developers will have, but it’s worth a shot. Fortunately, it’s likely that design review will be required for this project. We will share information on public comment when it becomes available. In the meantime, your best bet to offer feedback for the project is to use the comment form on the development’s website. Be sure to select “other” for the contact category so it’s directed to the right people. Perhaps we can make a difference in improving this project. SHARE YOUR THOUGHTS: Would these improvements help improve the Jensen-Byrd District plan to make it more future-proof and vibrant? Would you approve of a better connection from the Pedestrian Bridge, given the large amount of public funding going to that project? What about brick paving for Main Ave? Share your thoughts on Facebook, on Twitter, and in the comments below. We love to hear from you!